On December 2, the Eleventh Meeting of States Parties to the Mine Ban Treaty (11MSP) approved the Article 5 extension requests submitted by Algeria, Chile, the Republic of Congo, the Democratic Republic of Congo and Eritrea. Article 5 of the Mine Ban Treaty is the article that mandates all states parties to clear all mined areas within the states’ areas of control within 10 years of the treaty entering into force. In 2006, the Seventh Meeting of States Parties created a process for state parties to request additional time to complete demining activities, an option sought by 23 states to date (17 states have completed their demining obligations without needing extensions, ahem). Here I would like to review the requests and approvals for the extension requests of Algeria and the Democratic Republic of Congo (DRC); I’ll review the requests of Eritrea and the Republic of Congo is later posts. Algeria’s anti-personnel mine contamination stems mostly from the war of independence from France (1956-1962) and the recent civil war (1994-1995). The landmines from the war of independence were laid by French forces in mine-belts totaling 2,500 kilometers in length. Demining in Algeria has taken place in two phases, the first from 1963 to 1988 which resulted in the clearance of nearly 8 million (!) landmines from a 500 square-kilometer belt; the second phase began in November 2004 and is on-going, clearing an estimated 7,150 mines per month (i.e., 600,000 mines in total). The mines laid by the Algerian army in 1994 and 1995 have all been cleared and what remains to be cleared are two mine-belts – one in the east of 887 kilometers covering 31 municipalities across four provinces and the other in the west of 192 kilometers covering 12 municipalities in two provinces. Algeria requested an extension of five years, until April 1, 2017, to complete the remaining demining tasks it had identified. The extension request demonstrated Algeria’s confidence that the extent of landmine contamination was known and manageable; Algeria simply recognized that it had started the demining process too late to be able to complete the task in the original ten-year period. Demining in Algeria is entirely conducted by the Algerian corps of Combat Engineers and is complete funded by the state; no external assistance or support was needed or sought. Algerian engineers had determined that manual demining was most appropriate for the terrain and for reliability. Since the start of the second phase of demining, landmine accidents have grown infrequent, from 126 casualties in 2005 to just one in 2010. Algerian engineers have calculated that they will be able to clear 4.9 linear kilometers per team month and by deploying three teams in the east and two in the west, all of the extant minefields shall be cleared with two notable exceptions. Two “historical sites” consisting of short segments of the Challe et Morice mine belt are to be preserved as open-air museums to commemorate landmine victims and martyrs from the war of independence (the Challe et Morice belt is the border established by the French to prevent Algerian independence fighters from receiving assistance from allies in Tunisia; my guess is the preserved section is to demonstrate the lengths the French government was willing to go to in order to preserve its dominion over Algeria) (AP Mine Ban Convention Implementation Support Unit, pdf). The request from Algeria was considered to be “workable, comprehensive and complete… demonstrating a high level of ownership over the challenge” and the International Campaign to Ban Landmines (ICBL) called the request “well-reasoned” but asked for some additional clarity about exactly which areas still required demining. The fact that Algeria was fully covering the cost of compliance for demining was applauded by ICBL and by the 11MSP reviewers. ICBL did note that the preservation of mined areas, the Challe et Morice museum, was not allowed under the Mine Ban Treaty and that these areas would need to be cleared in order for Algeria to fully meet its Article 5 obligations (ICBL). The 11MSP granted Algeria’s request without hesitation and made only one qualifying remark, that Algeria should provide annual updates on the progress to date during the extension period to the Standing Committees on demining, future Meetings of the States Parties and the Third Review Conference (likely to be held in 2014) (AP Mine Ban Convention Implementation Support Unit, pdf). The Democratic Republic of Congo requested a 26 month extension to complete its demining obligations, giving a revised deadline on January 1, 2015. At the time DRC ratified the Mine Ban Treaty in 2002, the government believed that there were 182 suspected hazardous areas that would need to be surveyed and possibly cleared. Since then, an additional 722 suspected mined areas have been identified, bringing the total number of sites to be surveyed to over 900 covering more than 800 square kilometers. The majority of these suspected areas have been re-classified as part of a “database cleanup” as “battle areas” and are contaminated by other explosive remnants of war, not anti-personnel landmines. The actual number of suspected or confirmed sites with anti-personnel landmine contamination is 82 (12 confirmed, 70 suspected). The request from DRC is actually two-fold: the additional 26 months are needed to complete ongoing assessments, the General Mine Action Assessment (GMAA) and the General Mine Action Survey (GMAS), to determine the “new baseline of contamination.” National standards for clearance with quality controls and accreditation processes for mine action operators have been developed and are in the process of formal adoption and these new standards will inform the development of the baseline. Once the baseline is established, a second extension request will be submitted to provide the necessary details on how the Article 5 obligations shall be fully met. At this time DRC is unable to provide a comprehensive plan for meeting its Article 5 obligations because the GMAA and GMAS have yet to survey the 70 suspected areas, surveys which will be performed between January 2013 and November 2014. A key issue mentioned in the extension request is cost. Unlike Algeria, DRC is highly dependent upon outside assistance to complete its demining activities. Two international operators, Mines Advisory Group and Handicap International, will be relied upon to provide the technical training and capacity to the Armed Forces of the Democratic Republic of Congo (FARDC) to conduct survey and demining. In addition, whilst DRC will contribute some $1.5 million annually to all aspects of mine action, the actual budget is more than $30 million per year, meaning that DRC will almost $90 million in external assistance to fund its mine action programs (and, I suppose it goes without saying, that only $600,000 per year will be spent on victim assistance compared to $5 million for “coordination”) through the end of the initial extension period (AP Mine Ban Convention Implementation Support Unit, pdf). In its commentary on DRC’s extension request, ICBL expressed a lot of concern about DRC’s ability to pay for the proposed mine action program. At the moment, DRC receives about $15 million annually in international contributions for mine action, half of what is needed according to the extension request, but there was no plan for how DRC would make up that shortfall, or what the consequences would be if it could not. The ICBL also noted the slow pace of landmine clearance in DRC, only 1.28 square kilometers since 2001 (remember that one Algerian team of combat engineers goes through three times that in a month), and seemed to express reservations about the ability of DRC to ramp up its demining to meet the expected demand. However, the ICBL did appreciate that DRC wanted to get a complete picture of its contamination and prepare a comprehensive solution that continues to build national ownership of the landmine problem as United Nations peacekeeping and mine action teams wind down (ICBL). In its approval of DRC’s extension request, the 11MSP applauded DRC’s efforts to “garner an understanding of the true remaining extent of the challenge and develop plans accordingly.” The 11MSP then recognized the fact that DRC would “produce a detailed plan and submit a second extension request” (AP Mine Ban Convention Implementation Support Unit, pdf). The Algerian request and entire demining infrastructure should be held up as examples to other states parties. Okay, Algeria started late, but once it started demining, it provided the technical, financial and human resources to the task needed and when Algeria realized that it would need additional time, a thoughtful and complete request was submitted for comments and review. My concern about approving an interim extension request, such as DRC’s, is the fact that such an approval could be construed as tacit approval for the final extension request, whenever that is submitted. And in the case of a request like DRC’s that is completely dependent upon external assistance to even get to the point of submitting a final request, can the Meeting in good faith approve the request without the necessary funding being secured. Approving Algeria’s request for an extension was easy: Algeria has everything it needs to meet its Article 5 obligations except time, thus the extension request and ready approval. DRC needs more than just time and so the standard for approving the extension must be much higher, or the commitment from the Meeting that much greater. Neither was in evidence in the terse decision to approve DRC’s request. Should DRC fail to complete the survey work and fully determine the extent of the landmine contamination by the time the next extension request is due, what recourse will the Meeting of States Parties have? No sanction mechanism is available under the Mine Ban Treaty so what other option exists? Shame is a powerful weapon and certainly states would seem to want to avoid being called out for failure to meet their Treaty obligations, but it’s not enough. Will a future Meeting of States Parties have to commit to fund whatever portion of DRC’s mine action plan that remains unfunded? ICBL and the 11MSP allude to these issues, but do not grapple them head on. 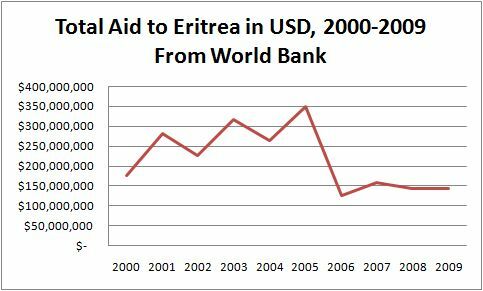 More on this when I discuss Eritrea’s and the Republic of Congo’s extension requests. December 7, 2011: This post has been edited to correctly attribute the AP Mine Ban Convention Implementation Support Unit (ISU) as the source of documents related to extension requests and decisions. November saw the publication of the 2011 edition of The Landmine Monitor and the opening of the Eleventh Meeting of States Parties to the Mine Ban Treaty (11MSP) in Phnom Penh, Cambodia. These two events help to remind the global community of the continuing threat that landmines pose and the reports of new usage of mines in Libya (and elsewhere) was a major theme to coverage of these events (BBC News). With news stories also covering landmine-related incidents and events in Sudan, South Sudan, Rwanda, Burundi, Angola and Somalia, let’s start this month’s wrap-up on the positive side of the ledger. South Sudan became the 158th state to ratify or accede to the Mine Ban Treaty in mid-November (All Africa). Since the signing of the Comprehensive Peace Agreement that ended the civil war in Sudan and established the process for South Sudan to emerge as an independent state in July of this year, demining, risk education and victim assistance activities have been conducted in South Sudan, all 10 of whose states are considered mine-affected. Acceding to the Mine Ban Treaty was South Sudan’s first international treaty action as an independent state. On the first day of the 11MSP, Burundi declared itself to be free of anti-personnel landmines. Remarkable for a country that faces significant economic and political challenges, Burundi has been able to achieve this milestone a full three years prior to the Treaty-mandated deadline for mine clearance (Monsters and Critics). Rwanda conducted a stockpile destruction exercise in conjunction with the Regional Centre on Small Arms, destroying over 40 tonnes of ammunition that had been recovered from rebel groups and from old stockpiles held by the Rwanda Defense Forces. The exact composition of the stockpile to be destroyed was not clear, but the act represented a continued effort by the Rwandan government and military to eliminate unexploded ordnance and explosive remnants of war. In past exercises, Rwanda had destroyed over 1,000 landmines (All Africa). In Angola, demining activities continue apace and Mines Advisory Group (MAG) reported on an effort to re-open schools in Moxico province, schools that had been closed due to the presence of landmines on school grounds. By clearing 248,000 square meters of land and working with donors, MAG reports that construction of a new school will be completed before the end of the year and the teachers will receive special training in mine risk education to help ensure the safety of their pupils (Alert Net). For the first time since 2004, the number of countries using landmines increased, including Gaddhafi’s regime in Libya (The Monitor). New usage of mines is also suspected in South Sudan and Somalia, but has not been confirmed officially by The Monitor. In South Sudan’s oil-rich Unity state, a war is brewing. Rebel groups in the areas appear to be using landmines, especially anti-vehicle mines, to disrupt traffic and oil extraction activities. New mines have also been placed around the disputed territory of Abyei. Unfortunately the presence of these new mines has only been revealed by catastrophic accidents such as the October 9th incident when 20 people aboard a bus in Unity were killed by an anti-tank mine and the August 4th incident when 4 peacekeepers were also killed by an anti-tank mine (All Africa). As mines continue to be laid, two of the most vulnerable populations are refugees moving through the newly mine-affected area and refugees returning to their home areas. Newly mined areas won’t be marked and refugees lack the recent knowledge to know where potential minefields might lie. A second nascent conflict is emerging in Sudan’s South Kordofan state, just north of Unity state. The Sudanese army has shelled villages in South Kordofan driving refugees across the border into Unity state where the new minefields threaten refugees. The United Nations High Commission for Refugees is trying to relocate a refugee camp in Yida in Unity state where hundreds of South Kordofan refugees have sought security (All Africa). The rebel group in Unity state, South Sudan Liberating Army, has announce a planned offensive for December, allowing enough time for the refugees in Yida to be moved (All Africa). Prior to July, South Sudan was on target to complete demining of its territory by 2014. However, the new use of landmines means that at least six more years (until 2017) will be needed to complete the demining, a deadline that could get pushed further back as rebels continue to mine roads, sometimes within hours of their clearance by international and domestic operators. The hospitals in South Sudan, despite the nascent state having a comprehensive victim assistance policy, are not up to the task of comprehensive rehabilitation of landmine survivors (Voice of America). In Somalia, the impact of Kenya’s invasion and Ethiopia’s encroachment has been to cause the Al Shabab rebels to switch their tactics. Whereas before Al Shabab would operate in the open (having no real resistance in the country before Kenya’s incursion), now Al Shabab is pursuing a dedicated insurgency campaign that relies on improvised explosive devices and landmines. Two towns near the Kenya-Somalia border, Garissa and Mandera, have been the sight of several grenade and landmine attacks that have been attributed to Al Shabab (All Africa) (All Africa) (All Africa) (All Africa) (All Africa). Garissa and Mandera are the nearest towns to Dabaab refugee camp where thousands of Somalis sought refuge after the summer’s famine. In addition to the attacks on Kenyan soil, Al Shabab continues to operate in Mogadishu with October and November seeing the greatest number of casualties from landmines and IEDs. Ten people were killed by landmines in the last four days of November alone in at least three different incidents (Press TV) (All Africa). Another incident occurred at a main crossroad in the Bakara market (Americans will remember Bakara market as the site of the Black Hawk Down events), when a buried landmine killed at least four people (Mareeg). These new use of mines in South Sudan and Somalia almost certainly mean that landmine casualties in these two countries will be higher in 2011 than in 2010, and they were already the African countries with the most casualties – 82 in South Sudan, 159 in Somalia – in 2010. In Libya, the long process of demining is just beginning. The international community continues to be focused on shoulder-fired rockets (known as MANPADS) and the threat to airline travel posed by such rockets (All Africa), but the real focus should be on the ground, not in the skies. Dozens of Libyans have been killed or injured handling unexploded ordnance (UXO) and Libyan Red Crescent volunteers have been trained in mine risk education techniques to spread the word about the dangers of landmines, grenades, mortar shells and cluster munitions (Geneva Lunch). The Joint Mine Action Coordination Team (JMACT) in Libya hosted Georg Charpentier, the United Nations Resident and Humanitarian Coordinator for Libya, on a tour of mine and UXO-affected areas in Misrata (JMACT), and Mr. Charpentier responded by calling for more support for mine clearance activities (United Nations). Here’s hoping Mr. Charpentier’s words are heeded. Michael P. Moore, December 1, 2011. This week, the Eleventh Meeting of States Parties to the Mine Ban Treaty (11MSP) is being held in Phnom Penh, Cambodia and last week, the International Campaign to Ban Landmines released the 2011 edition of the Landmine Monitor (The Monitor). These two events create an opportunity to review recent news in the mine action community. There has been some good news. In one of the first announcements at the 11MSP Burundi declared itself to be landmine-free (Monsters and Critics). South Sudan acceded to the Mine Ban Treaty as its first major interaction with the international community (The Monitor). The Monitor reported that in 2010, the total number of persons killed or injured by landmines in Africa had declined from 629 to 615 with more than half of the mine-affected states on the continent reporting fewer casualties than the previous year. That good news has been over-shadowed by the bad news. More casualties were reported in seven mine-affected states (Angola, Eritrea, Mozambique, Senegal, Somalia, South Sudan, and Sudan) in 2010 than in 2009. New landmine usage has been reported as conflicts broke out or escalated in Libya, South Sudan and Somalia meaning that landmine casualties can be expected to increase in 2011 from 2010. Despite the fact that for the first time in four years new countries (Finland, South Sudan and Tuvalu) have acceded to the Mine Ban Treaty, global landmine use is higher than it has been since 2004 (The Monitor). Only one state in Sub-Saharan Africa, Somalia, remains outside the Mine Ban Treaty, whilst three North African states, Egypt, Libya and Morocco, have failed to accede to the Treaty; all four countries maintain stockpiles of anti-personnel mines. Nigeria declared itself to be landmine-free, the 18th state to do so globally, joining Gambia, Malawi, Rwanda, Swaziland, Tunisia and Zambia as landmine-free African states. Angola and Chad have more than 100 square kilometers contaminated by landmines and the unofficial regions of Western Sahara and Somaliland are also mine-affected. Sudan, Angola and Mozambique cleared more than 13 square-kilometers of mine-affected areas in 2010, an increase over 2009’s 12 square-kilometers. Algeria, the Democratic Republic of Congo (DRC), Eritrea and the Republic of Congo have all submitted requests for extensions of their demining obligation deadlines. Of the African states that have already received deadline extensions for demining, Guinea-Bissau, Mauritania and Mozambique are on-track to meet their new deadlines; Senegal, Uganda and Zimbabwe are all falling behind on their schedules and Chad’s progress is unclear. Angola, Chad and DRC conducted nationwide assessments of victim assistance needs as part of the process of drafting a national victim assistance plan. Uganda, DRC, Mozambique and South Sudan have developed (with various degrees of approval and implementation) national victim assistance plans and Burundi and Chad have begun the process of drafting plans. 20 African states received more than $100,000 in international contributions in 2010 for mine action assistance. Angola was the largest African recipient, receiving $45.7 million in 2010, Sudan was next with $27 million and DRC was 3rd with $13.2 million. These three nations were the only African states in the top ten recipients globally, a chart easily topped by Afghanistan which received $102.6 million. Only 9% of all mine-action assistance globally went to funding victim assistance (The Monitor). Michael P. Moore, November 29, 2011. October’s African mine action stories featured ongoing discussions at the United Nations, the continuing conflicts in South Sudan and Libya, Kenya’s invasion of Somalia among other items of interest. Senegal, Western Sahara, Angola, Mauritania and Zimbabwe also appeared in news outlets. There were positive developments and some setbacks as the mine action community gears up for the 11th Meeting of States Parties in Phnom Penh, Cambodia at the end of November. 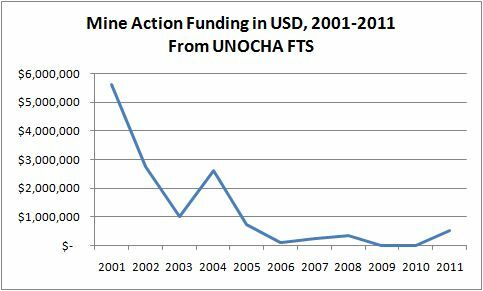 Each year, during the United Nations General Assembly’s First Committee (a committee of the whole that addresses issues of peace and international security) meetings, a resolution is debated and passed encouraging adherence to the Mine Ban Treaty and international cooperation on mine action, especially demining and victim assistance (Reaching Critical Will, pdf). This year was no different with the resolution passing unopposed with 155 states voting in favor of the resolution on October 28th. Seventeen countries abstained; all of the abstaining votes come from non-Parties to the Treaty, including two mine-affected African states, Libya and Egypt. (Personal aside: I’m a bit surprised that the new regimes in Libya and Egypt abstained from this vote; this was an opportunity to demonstrate a clean break with the former regimes.) Thirteen African states were absent from the vote including four mine-affected states: Chad, the Gambia, Somalia and South Sudan (Reaching Critical Will, pdf). During the debates of the First Committee, statements related to the continuing threat of landmines were made during the thematic debate on conventional arms by Senegal (Reaching Critical Will, pdf) and the Democratic Republic of Congo (Reaching Critical Will, pdf). The thematic debate focused on the 2012 negotiations of an Arms Trade Treaty (ATT) to regulate the international trade of small arm and light weapons and the references to landmines tied in issues of victim assistance and international cooperation, elements so important to the Mine Ban Treaty, which should illuminate the debates around the ATT. The International Campaign to Ban Landmines also made a brief presentation, providing a global view of the continuing threat of landmines (Reaching Critical Will, pdf). In Senegal, Handicap International and the City of Geneva provided the funding for a new demining bulldozer. The bulldozer will operate in the mine-affected Casamance region and greatly speed up the demining process, especially since plastic mines have been used in this area which cannot be detected by standard metal detectors (All Africa). The Marshall Legacy Institute and the Angola National Institute for Demining have signed an agreement to introduce mine-detection dogs to the country. The initiative, funded by the US government, will speed up the demining process in the country by further diversifying the techniques available to deminers (All Africa). This news follows announcements of minefield clearances by the HALO Trust (All Africa) as well as reports of new injuries (All Africa). Pambazuka News published a special issue on Western Sahara, calling it the last colony in Africa. With articles on the history of the Polisario Front and the annexation of Western Sahara by Morocco, Pambazuka also reminded readers of the staggering number of landmines along the berm built by Morocco to separate areas controlled by Morocco from those controlled by Polisario (Pambazuka). If you would like to get involved in mine action advocacy, the Landmine and Cluster Munition Monitor is recruiting a Coordinator who will be responsible for putting together next year’s Monitor. The Landmine and Cluster Munition Monitor is widely considered the authoritative annual report on mine action and is released annual in conjunction with the Meeting of States Parties to the Mine Ban Treaty. The announcement can be found here: http://www.stopclustermunitions.org/news/?id=3471. With the death of Moammar Gaddhafi, the National Transitional Council in Libya declared the end of the revolution as the new leadership of the country was recognized at the United Nations General Assembly meeting. The lingering effects of the war and the Gaddhafi regime will likely be felt for many years as tens of thousands of landmines litter the Libya landscape and stockpiles of weapons of the old regime have been looted or seized by various militias. The United States, concerned most about the threat of shoulder-fired anti-aircraft missiles (MANPADs) to international airlines, has increased its commitment to destroying stockpiles of weapons in Libya to $30 million. Two demining organizations, Mines Advisory Group and the Swiss Demining Foundation, have received the lion’s share of this funding and have been using the funds to conduct demining activities in addition to stockpile destruction (Washington Post). A former US ambassador to Morocco stated that one of the priorities for development in Libya will be the elimination of minefields in the country to allow free transport within the country (Huffington Post). At the United Nations, Libyan representatives confirmed that demining was a priority for the new government, especially removal of the new landmines laid by Gaddhafi’s forces during recent combat. The Libyan representative declared the countries intention to seek assistance from the United Nations and the international community for mine clearance (United Nations). One area that was not mentioned in great depth is the immediate need for victim assistance in Libya. During the final assaults on Sirte, the local hospitals were overwhelmed by casualties (Digital Journal), and the medical infrastructure necessary for long-term rehabilitation simply does not exist. Some of the most severely wounded Libyans have been evacuated to the United States for emergency treatment, but they are only a handful of the thousands who need assistance now and will continue to need assistance in the future (AFP). In addition to the demining assistance provided by the international community, victim assistance should be a priority for Libya. Reports indicate that arms from Gaddhafi’s arsenals, including landmines, have leaked into neighboring states. In Mauritania, Al Qaeda in the Maghreb has taken up residence in Mali’s Wagadou Forest – where they had previously been based until being driven out by Mauritanian forces – and has laid landmines around the area to prevent entry by Malian and Mauritanian security forces. One person has been killed and two other wounded by these new mines (Maghrebia). Three employees of the Danish Demining Group, an American, a Dane and a Somalian, were abducted in central Somalia by members of Al Shabab on October 25th. The Danish Demining Group (DDG) has been working in mine action in the semi-autonomous region of Puntland for many years and the employees were seized after providing a mine-risk education workshop. The kidnappings followed other abductions of Westerners in Somalia and Kenya (The Telegraph). Traditional elders in Mogadishu have condemned the abductions and called for their immediate release (All Africa). The abductions also followed the October 16th invasion of Somalia by the Kenyan army. Kenya, feeling its tourist industry threatened by the abductions of Westerners from resorts and the continuing refugee flights of Somalis fleeing the twin scourges of violence and famine, responded with its first military action against a neighbor in its history. At the behest of Somalia’s Transitional Federal Government and with the logistical and military support of Western states (including France who had already been involved in military actions in Cote d’Ivoire and Libya), Kenya’s army and air forces attacked Al Shabab territory in southern Somalia, especially around Kismayo (IRIN News). Already Kenyan soldiers have been subject to harassment attacks including the use of landmines by Al Shabab on the roads to and from Somalia (All Africa), and these incidents are likely to increase. Kenya’s invasion represents the third force to try and provide some security and stability to Somalia in recent years. For many years, a peacekeeping force consisting of Ugandan and Burundian soldiers has been present in the country serving as the de facto security force for the UN-accepted TFG in Mogadishu. A couple of years back, the Ethiopian army (with support from the United States) invaded Somalia and took down the Islamic Courts Union, which has since transformed into Al Shabab who is the target of Kenya’s military actions. Another military force in this starving, landmine-littered country is the last thing Somalia needs. Just as the rains are beginning to fall and the drought might be lifting, this new round of violence is creating additional displacement, just at the time when refugees and the displaced need to be returning to their homes. Violence continues in South Sudan’s Unity State as rebel forces there have also placed many anti-tank mines in the roads. Anti-tank mines are not banned by the Mine Ban Treaty and so rebels may be able to access them from any number of sponsors. In October, a bus struck such a mine, killing 20 people, on a road that had previously been considered free of mines. Demining agencies, including Norwegian Peoples Aid and the local Mine Action Center expect more mines to be laid in the coming weeks as the dry season arrives (AFP). As the United States continues to develop the Spider Networked-Munition system, an “alternative to anti-personnel landmines” (US Army, pdf), a couple of incidents reminded Americans of how dangerous these items are. First, four landmines were found in a passenger’s luggage at Salt Lake City Airport. The passenger in question had taken the mines as souvenirs following military training. Never one to miss an opportunity to inform the public, “TSA officials wanted to remind passengers that land mines are among the prohibited items that aren’t allowed on airplanes.” The mines had apparently been defused and were removed from the baggage. The idiot who tried to bring them on the airplane was not arrested (Salt Lake Tribune). In New York City, a Yonkers man found a World War II-era “bouncing betty” landmine in his grandfather’s attic. He brought the item first to an antiques dealer trying to sell the item, but the dealer, deciding that a landmine was not something he wanted in the store, directed the man to a nearby police station. However, the man with the mine was not familiar with the area and, missing the police station, walked half a mile until he reached a firehouse which was promptly evacuated along with the surrounding block. No word on whether or not the mine was live or defused (LoHud.com). Coming up on November 28th is the 11th meeting of States Parties to the Mine Ban Treaty to be held in Phnom Penh, Cambodia. Information about the meeting, including the draft agenda can be found here: http://www.apminebanconvention.org/?id=3618.